Dean Austin says he is in no rush to appoint his assistant manager at Sixfields - but has confirmed when he does it will be somebody he already knows and ‘shares the same philosophy’ as he does. Austin was named the new Cobblers boss on a two-year deal at the weekend. He did enough in a caretaker stint in charge over the final five games of the Sky Bet League One season to persuade chairman Kelvin Thomas he is the man to take the club forward following their relegation, and now he is looking to bring in his own right-hand man. Prior to stepping up to the managerial role, Austin was employed as assistant to previous boss Jimmy Floyd Hasselbaink at Sixfields, the pair joining the club on the same day in September, 2017. And although they came as a team, the pair had never worked together before, and Austin will be making sure his Sixfields number two is somebody very familiar to him. 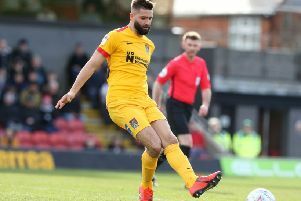 “It will be somebody that I know, and it will be somebody who shares the same philosophy and methodology as myself,” said the Cobblers boss, who is scheduled to go on holiday next week. “I am going to take my time though, I have spoken to one or two people already, and I have some ideas and what have you. During his caretaker spell, Austin’s assistant was Jon Brady, who stepped up from his role as Under-18s manager. The former Brackley Town boss is to return to working with the Town youngsters, but Austin made it clear he has plans to bring the youth team squad and the first team squad closer together, especially as he feels some of the club’s teenagers are exciting prospects. “From Jon’s point of view, he has been brilliant,” said Austin. “He is primarily going to go back to the under-18s, but I have something a little bit more specific with him as well, to be integrated with the first team. Another face on the bench during Austin’s time in caretaker charge was head of recruitment Andy Melville, who was rarely seen at Sixfields on matchdays when Rob Page, Justin Edinburgh or Hasselbaink were in charge. But the Welshman was at Austin’s side for his five games at the helm, and although that won’t be the case next season, Melville will be much more involved with the first team squad. “Melv will probably go back to the scouting side,” said Austin. “It was imperative for me that I had people around me who I trusted, and who would be there to help me, because everyone needs help. “You have to have the right people around you, and I did. “But Melv is obviously the recruitment officer here, and he and I work very closely together anyway. “He will be around as and when I want, and he will be at the training ground a couple of times a week and what have you. “I think it is very important when you work in a certain way, and you want to play in a certain way, and in a certain style, it’s important from his point of view that the recruitment officer sees the way you are working.